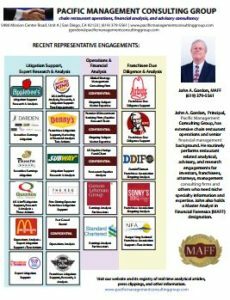 John A. Gordon is a restaurant subject matter expert, who founded Pacific Management Consulting Group in 2003 to provide complex analytical and research services on restaurant topics. He has 45 years in restaurant operations, corporate staff and management consulting roles. Examples of What We Do: We focus upon restaurant strategy, operations and financial management topics. This includes concept assessment and review, new business planning, restaurant earnings and economics reviews, valuations, merger and acquisition analysis; SEC earnings disclosure matters; revenue, expense and capital projects ROI analysis, corporate organizational (G&A) reviews, and special business intelligence projects. We specialize in investor side due diligence, SEC earnings disclosure damages analysis, and serve as restaurant subject matter expert to investors, and provides exclusive support to a restaurant buy side team, other management consulting firms, law firms and private equity firms who need deeply granular restaurant intelligence. Via expert witness engagements, we provide detailed research, discovery plan and analysis, deposition and trial support for restaurant litigation projects, accomplished via over 40 state, US federal and Canada litigation engagements to date. We follow and track all US publicly traded restaurants, including the quick service (QSR), fast casual, casual dining and fine dining sub-sectors. We have developed a subspecialty of franchising standards and practices, and work on non public, independent and smaller/emerging restaurant situations. Gordon’s expertise: Gordon has over 45 years of experience in chain restaurant operations (QSR operator), and managerial finance roles (cost/financial analyst for New York Stock Exchange listed steakhouse chain, and manager of financial analysis and chief financial officer at a global hospitality operator). He was of counsel to Booz Allen, a global strategy management consulting firm and founded his own consultancy, Pacific Management Consulting Group in 2003. He graduated with a BS Business from Indiana University. Certifications and Publications. He is a certified Master Analyst in Financial Forensics (MAFF). He is often cited in the business press on restaurant topics, including by ABC News, CBS Radio, CNBC, The Wall Street Journal, The Economist, Forbes, Bloomberg, Associated Press, The New York Times, The Washington Post, The Globe of Canada, The New York Post, The Los Angeles Times, The Columbus Dispatch, The Chicago Tribune, The Denver Post, The San Diego Union Tribune, The Seattle PI, Franchise Times, Nation’s Restaurant News, Restaurant Finance Monitor, Restaurant Research, Franchise Valuation Reporter and others. He has moderated and served on panels at the Restaurant Finance and Development Conference (2017, 2015, and 2014), NACVA Restaurant Topics Panel (2014), the National Restaurant Show (2013), and Women’s foodservice Forum (2012), and others. What we believe: independent, non-conflicted and certified analysis and expertise; we focus on the fundamentals not the fluff. We have a non-consensus outlook in that we look beyond the obvious situation at hand. And we’ll deliver a full suite of opinions and solutions, including the most creative opinion that others won’t present.